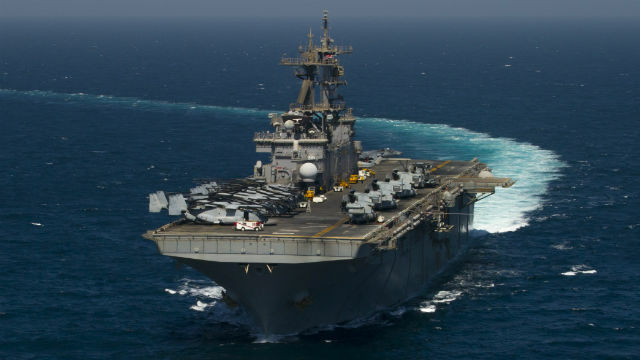 The USS Essex amphibious group and with Marines from Camp Pendleton left the Middle East on Sunday headed for the Pacific and eventually home to San Diego. From August to October, the AV-8B Harrier jets on the Essex took part in the multinational strikes against Islamic terrorists in Syria and Iraq. The amphibious group includes the amphibious transport dock USS Anchorage, amphibious dock landing ship USS Rushmore and the 15th Marine Expeditionary Unit. While on station with the 5th Fleet in the Middle East, the group trained with the French military in Djibouti and with Jordanian marines. With the Middle East behind them, the nearly 4,500 Sailors and Marines in the group will enter the 7th Fleet area and continue operations there before completing their scheduled seven-month deployment at the end of the year.